We’ve seen some really interesting reviews come through in January. In fact, it’s been such a great month for reviews that we couldn’t just pick one….so we’ve gone for two! 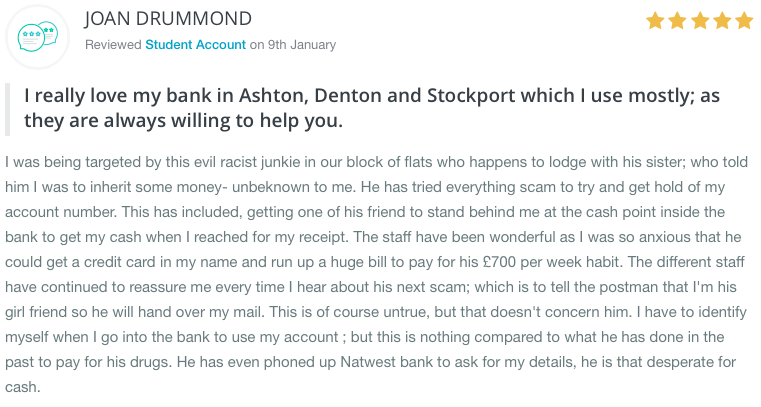 Despite a challenging personal situation, NatWest staff are highlighted as having “been wonderful’ throughout in this review. 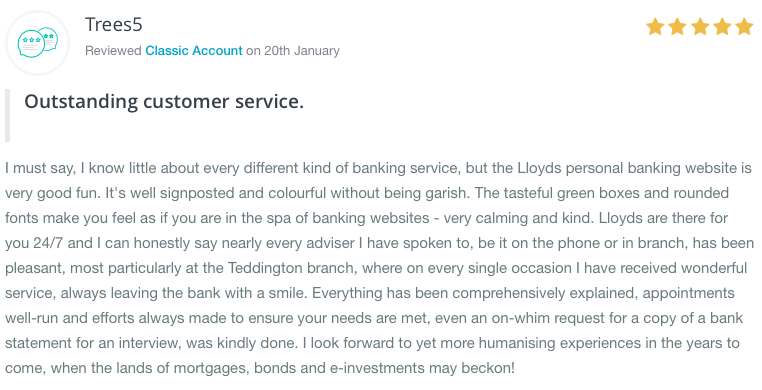 This review talks about Lloyds personal banking website being like a “spa of banking websites.” We also like how this review pulls out the importance of multichannel banking, commenting both on the online and branch channels. Our reviews have shown that as a group ‘switchers’ are happier with their banks. In fact, as a group, account switchers rated their new bank 4.75 / 5 overall. That said, we know that most customers simply ‘stick’ with their bank. This review from Mark is a bit of a favourite with the SmartMoneyPeople team. It focuses on how “a clear desire to put things right” can really turn around a bad experience. Moreover, Mark would now highly recommend Lloyds bank! TheBobbyB clearly loves his Nationwide mortgage, giving it top marks across the board. For a first time buyer, a mortgage application can be quite long and complex, and getting a hamper at the end is a nice touch! We still need your reviews for the British Bank Awards. All reviews submitted by the 13th February 2015 will be included. We’re running these awards to find the best banks in the UK. By using the power of your genuine customer reviews we can help other customers find the best banks and products for them. There’s even a cash prize on offer!